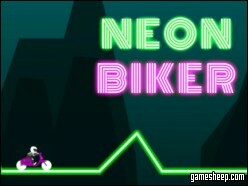 Objective: In Neon Biker you must perform crazy stunts while driving through the world of never ending roads! Choose a vehicle, perform flips and try to get as far as possible. Enjoy endless levels or play 40 seperate levels. We are glad that you have chosen to play Neon Biker on GameSheep.com, the most dynamic website available. If you like this game Neon Biker don't forget to rate it and this way you will help with selecting only the best games for the home page.